I caught Nirvana fever hard following the release of Nevermind, and this was one of the many records I scooped up during that time. (A lot of the other ones were bootleg 7"'s, though I do still have a UK 7" of "Smells Like Teen Spirit.") It was a wise purchase, as legitimate (non-bootleg) copies of this four-song EP have become scarce over the years. The original pressing was reportedly 3000, and they go for about fifty bucks on eBay these days. Not a ton of money, but I'm happy I got mine for far less than that and held onto it. This record, like I said, has four tracks. 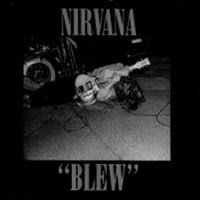 "Blew" and "Love Buzz" seem to be the same versions that are on Bleach, and the recording of "Stain" appears to be the same one that would later end up on Incesticide. "Been A Son" is also on this record and would also end up on Incesticide, but they're not the same versions. So, if you really like to nerd out (and I do), that's pretty cool. Plus, when I had this and Incesticide hadn't come out yet, this was one of the only ways to have legit copies of either of those songs, which was also pretty cool. A lot of songs like these were making the rounds on dubbed cassettes, but the quality varied. So I was happy to have the goods. Not much else to say about this one, aside from mentioning that it's always been one of my favorites, because it's remained one of the more oddball Nirvana releases and I used to really get off on showing it to people. Maybe I still do.